Take Profit - take profit value. Stop Loss - stop loss value. Trailing Start - trailing start. Trailing Step - trailing step/stop. Lock Start - lock start (first time trailing start). Lock Step - lock step (first time trailing step). TRUE - dynamic, pending order following price. FALSE - pending order static/fixed. Limit Pending - distance pending order with price. 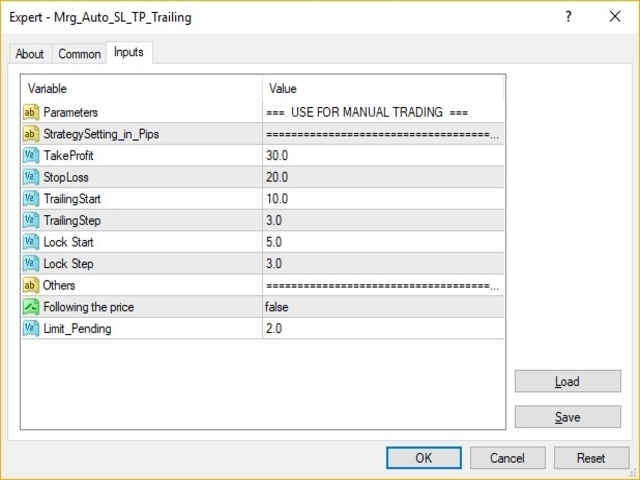 Install the Expert Advisor on MetaTrader 4 on the pair you want. The Expert Advisor will set Stop Loss, Take Profit, Trailing, that you do from all platforms. Very good trade helper. Each trade from the beginning secured in the way you set. In my opinion, it's best to set SL with a fixed value, TP with big value. However, you should use trailing stop in a place where you want TP and trailing step with a few pips. Instead of opening positions, I set the pending order following the price. Works super! Instead of opening SELL trade, It can go up if the price is going up. So, you don't need to be worry about negative values. Fixed bugs in putting SL / TP on Open market execution from mobile phone. Before : If OP Buy / Sell from mobile phone, can not automatically put SL / TP. After : When OP Buy / Sell from mobile phone automatically put SL / TP according parameters.